Identification: Scary-looking creatures having upturned and very dangerous tails with powerful stingers on the end. 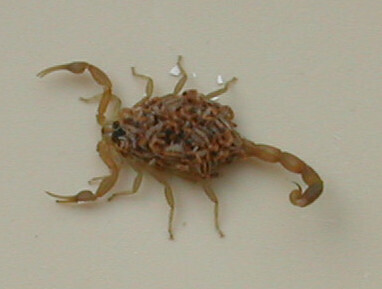 Biology and Life Cycle: Scorpions are not insects. They are arachnids and kin to spiders. All species are nocturnal and usually hide out during the day. Gradual metamorphosis. Habitat: Humid, protected spots in dry climates. 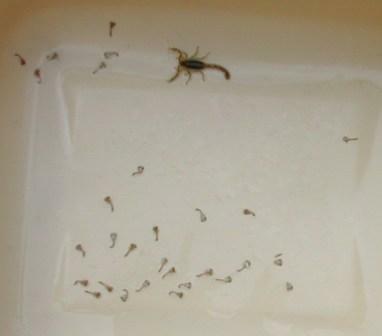 Feeding Habits: Scorpions will sit in the same spot for days, waiting for prey to venture by. The stinger is used to immobilize the prey while being held by the pinchers. They feed on insects like crickets and roaches. Economic Importance: Painful sting; but beneficial in that they are predaceous and eat roaches. Natural Control: Snakes. Remove wood piles and rock piles near the home; control the food source, such as crickets and roaches. During dry weather dusting natural diatomaceous earth around the foundation and especially near doorways will help greatly. During moist or humid weather, spray the same areas with the fire ant control mix (compost tea, molasses and orange oil). Other effective tool is the glue trap. The one that works the best for scorpions has the shape of a tent. These painful beasts are strongly attracted by the glue. Once they enter and get stuck, they are history.